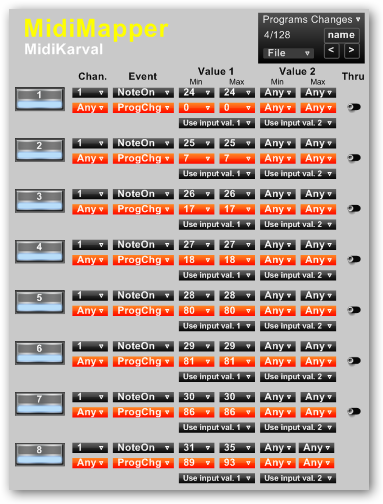 MidiMapper is a VST midi processor that allows the transformation of received midi events into other midi events. Moreover, the midi channels can be changed and the message values may also be mapped to other values and ranges, swapped, extended or reduced. So you can get (multi)splits or (multi)layers, modify your keyboard's "velocity response", change sound or add new sounds playing with “velocity switching”, transposing your keyboard up or down, use some of its keys for program changing, map controllers from one type (or data range) to another, play any type of chords with only one finger, change the intensity of effects (chorus, reverb, etc.) on the basis of the strength you play with and much more, storing your settings in one of the 128 available programs.